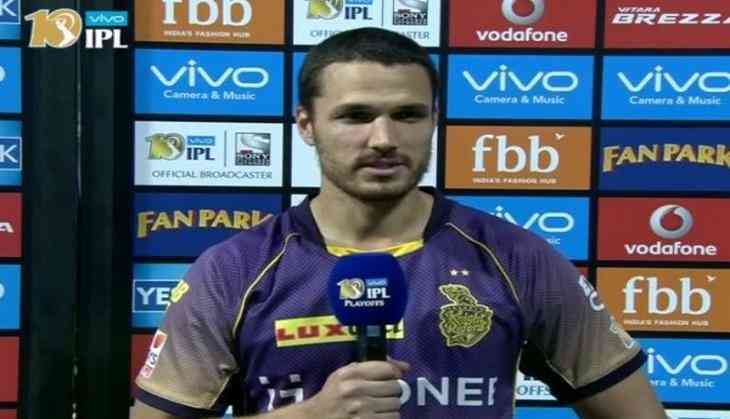 Kolkata Knight Riders (KKR) bowler Nathan Coulter-Nile believes batting would be pivotal in their upcoming playoff encounter against Mumbai Indians on a "slow, low track" of M. Chinnaswamy Stadium, Bengaluru. Coulter-Nile was KKR's highest wicket-taker in the first eliminator against SunRisers Hyderabad (SRH), which they won by seven wickets on Wednesday night. "It really comes down to who bats better. It is going to be long and slow wicket again, hard to get going. So it will boil down to who bats better," said Coulter-Nile in an post-match interview with iplt20.com. The Man of the Match bowled smartly to claim crucial wickets of Kane Williamson, Vijay Shankar and Chris Jordan and help KKR set up their clash with Mumbai Indians on May 19. Speaking about the bowling attack of the Rohit Sharma-led side, Coulter-Nile said, "They (Mumbai) has got a world class attack. Bumrah and Malinga are two of the best closers of the game. Plus (Mitchell) McClenaghan is going quite well. He has been taking wickets." "We have to work hard for the second clash. Our play is still going quite well, taking wickets. I think we have a pretty different bowling tactic than what we had at some bad times. I think that's something new we can bring up against them. Hopefully that's something new we can bring up against them," he added. The Australian cricketer was out of the tournament for two weeks due to a head injury. "I never had concussion before. Recovery and rehab after getting injured was tough. I was really tired, had headaches and was sick. But it wasn't much of a rehab or anything. I woke up this morning feeling pretty good so I put my hand up for selection," he said.